Posted on July 12, 2015 by Kathy O. The Burgeron Family had come together and created a movie of the classic fairytale – Goldilocks and the 3 Bears after reviews of the audio version were over the top positive. As virtual attendance to the festival is growing and becoming the option of choice, NanaLou, Great grandson DJ, Mama Boo, Cousin Ron, Cousin Bernie and some help from Dr. M and the famous Headless Inskspots (Viv and David) pooled their best and unique talents and come together with a short film. After MamaBoo had taken the lead and pulled the audio together, Bernie followed with the video edition. Cousin Ron was busy prompting with all sorts of new ideas – adding additional sound effects (like snoring and spoons!) and Dr. M suggested including more artists by asking if the Headless Inkspots were contacted. Along with the final movie outcome, intro and ending clips for future Family Story Time creations are available for anyone to use. If you would like to use them – just contact Bernie or the PR team. The other options created are in this folder. As a virtual attendance participant be sure to check out the video stories all the artists in residence – Sapphos and Cousin Ron have posted quite a few wonderful stories and audios for enjoyment. And watch for the debut of stories and music for the adults on “The Porch”. The festival is heading into week 3 and looks like more and more is coming available each day for festival goers! As Nana Lou mentioned awhile back, the Burgeron children have been enjoying evening readings of fairy tales, often by the campfire. Most evenings after dinner, when the weather is fine (as it often is here in Bovine County), we all gather ’round a fire, singing songs and telling stories–sometimes even a ghost story or two. The Burgeron children aren’t scared of ghost stories, of course, what with I and Little Boo being the family ghosts and so friendly and all. You might be wondering how we got those sound effects in there, what with this story being told around the evening campfire. Well, as you may know, we ghosts have a way with being able to make all kinds of strange sounds, and Little Boo was working in the background, adding the sound effects. You might also be wondering why Mama Boo’s voice is accompanied by those strange “ooooh” sounds. Well, I’m a ghost after all! It comes with the territory. To assist festival-goers in further developing their digital literacy skills and establishing a personal digital identity, each week we highlight a different topic being sponsored by the Bank of DS106 Assignment with volunteer support from the Open DS106 community. This week we offer “It’s All By Design”. Rather than specifying “assignments” everyone is encouraged to learn more about the topic, Design, by visiting the Open DS106 Syllabus and choosing something to create from an array of digital design projects. Each project links to examples of work completed by others. They also include links to tutorials that can help you learn how to complete the work. By tagging your web related posts (either on the Burgeron Family blog or a personal blog) with both DesignAssignments and DesignAssignments#### your work will be added to the list of examples. We found these tips for writing up ds106 Assignments in a blog post most helpful. Extra Extra Read All About It…. Children? Children? Where are the children in The Village? I’m not sure how I feel about finding out there is a nursery in the village. 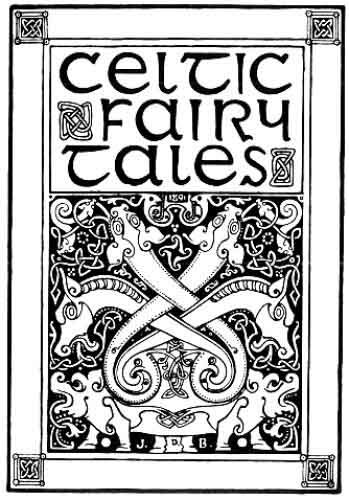 But I was totally delighted when I saw Number 6 reading fairy tales to the little ones on one of the tapes I had procured on a recent visit. As we all know The Village keeps meticulous records. There were a total of 17 video tapes in all. They each came with a title and a detailed account of what was on the tape. I was intrigued by the title of tape #16, “Once Upon A Time“, but was disappointed upon finding no fairy tales- only one more desperate dark attempt by Number 2 to extract INFORMATION from Number 6 by using some sort of a regressive therapy technique, directing a series of psychodramas in an “Embryo Room” where they go through the different stages of Number Six’s life hoping to extract why he resigned. Surprise, Surprise…. Number 6 thwarts Number 2’s fiendish efforts and reveals nothing of importance in the end. Then I popped in tape 15, “The Girl Who Was Death“. And there… in the last two minutes of the tape was dear Number 6 reading fairy tales to the village children from the village story book. Although I had easily hacked my way in to watching the videos in Dr. M’s screening room, due to an elaborate encryption of the tapes, I have thus far been unable to download them in a digital version which I can easily share with the rest of the family. But you know that’s not going to stop this ol’ lady. My creative problem solving skills kicked into high gear and I used my iPhone to record the scene playing on the TV. 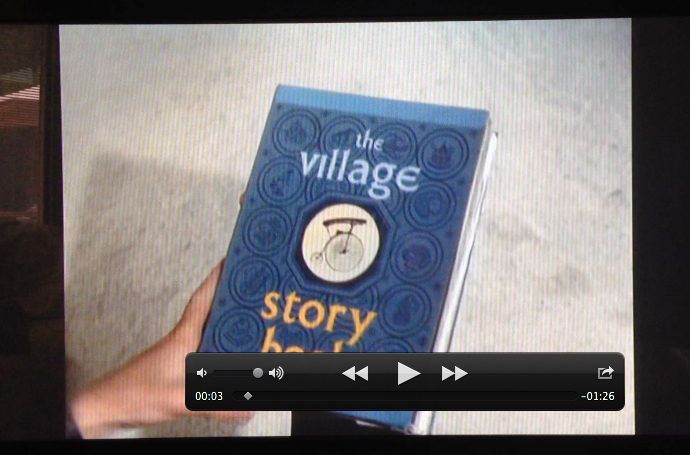 Then I used the Photo Transfer App to transfer the video to my iMac where I could more easily work with it- like capturing a frame that showed an image of the village story book. Using the Grab tool my first attempt at capturing the image resulted in the player bar being visible. Not good. Next I used iSkysoft iMedia Converter Deluxe to convert the slightly less versatile older .mov format to .mp4 so I could post it to YouTube and people who still used those buggy PC’s (as opposed to a wonderful iMac like mine) could watch it without problems. I realized after it was too late that I had forgotten to trim the end that showed the credits. I didn’t want those. Yippee! I didn’t have to delete the already uploaded video, I could use the “enhancements” option on YouTube to split and trim my video right there in place. No need to upload anything new. See for yourself how wonderful Number Six is with the village children. He’s promised to come back tomorrow night to read them another. Perhaps Cousin Ron can sneak him a copy of “The Little Butterfly and the Old House“. 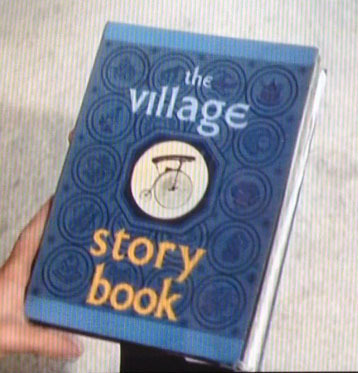 Or one of the Burgeron family can locate The Village Story Book and bring it back to the Bovine County Fairy Tale festival. What other stories might be in there? 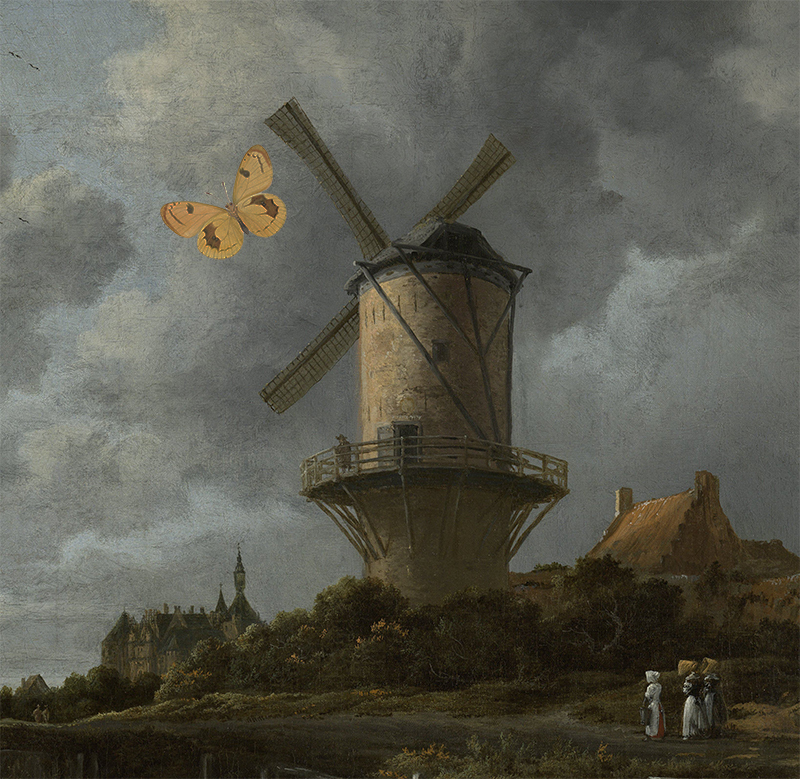 Over time many Dutch artists have been inspired by the fairy tale of the windmill and the butterfly. Today artists around the world continue to find inspiration in this ancient story. 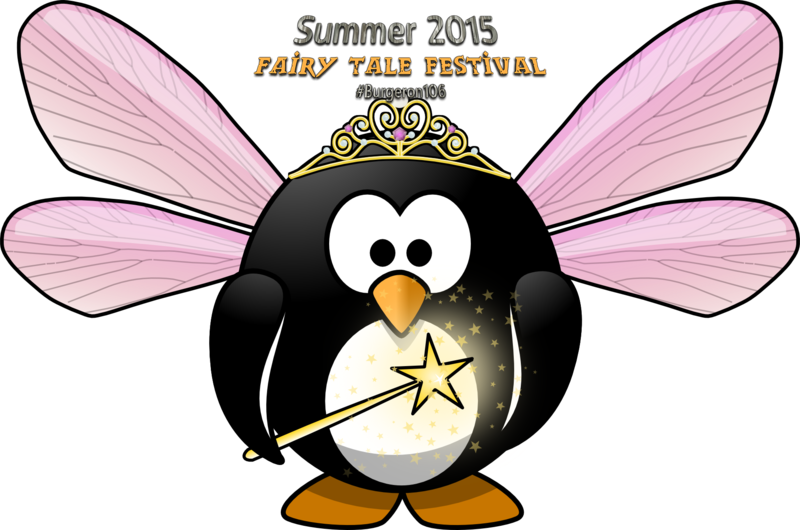 The Bovine County Fairy Tale Festival being held at the Burgeron place this summer features a few of their favorite artists below: OnePercentYellow, Ron Leunissen, and @rockylou22 . To learn more and join in on the fun visit the festival’s official promotional website. 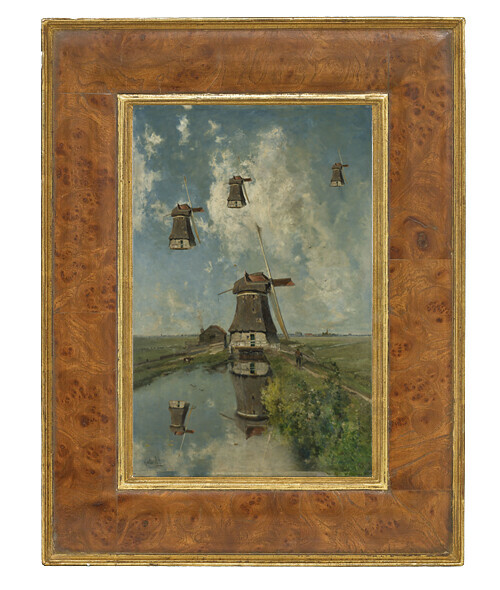 Old Dutch painting based on the fairy tale of the butterfly and the flying wind mill. Framed in wooden frame. Today’s artists finding inspiration in the Dutch fairy tale, “The Windmill and the Butterfly”. All styles and genres using many artistic and digital mediums have been inspired by the Dutch fairy tale. It was a magical night last night. Nanalou sitting under Dr. M’s tree house, the little Burgeron children snuggled together with the campfire crackling, the katydids and crickets singing their song, and the sweet music of Cousin Ron practicing piano drifting gently on the breeze. Professor Ryker T. Stork was quick enough to whip out his iPhone and capture the entire evening’s festivities of Nanalou telling the story of The Old Windmill & The Butterfly. Thanks to the following for letting us create more art with your art. It’s early in the evening when Nana’s sitting under the tree house of Dr M with all the Burgeron children gathered around her. Even little Boo has come to listen to the story Nana is about to tell. Once upon a time there was an old windmill that stood on its spot as long as the people could remember. The miller was very proud of his mill that was made by hand by his forefathers. No other windmill in the county could grind as fine as this one. From all over the county the farmers brought their corn to the miller. The old windmill was taken care of very well; an extra coat of paint in due time, some varnish on the sails, a good clean of the mill stone; no efforts were spared in order to keep the windmill in good shape. The miller dreamed of the moment that he could pass on his windmill to his eldest son, who was about to get married and who would continue the miller’s work with much love. But it wasn’t just the miller who dreamed. The windmill itself dreamed too. How much would he like to explore the wide world, to look upon the earth from way above, to make long journeys and have many adventures. “Oh yes, how much I would like to do all that,” sighed the old windmill. “Where’s that sigh coming from?” whispered the wind. The wind was the oldest friend of the mill. Over many years the sails had been dancing in full harmony to the wind. Even when it stormed and when the wind played a rough game upon the sails, they caught the blows without any complaints. At dawn the old windmill felt a breeze caressing its sails. The wind put a small, fluffy thing on a sail, a thing unknown to the mill. After a couple of days, on a sunny day, the cocoon – for that was what the wind had put on the sail – opened up, and a beautiful colorful butterfly got out. She was more beautiful than anything the windmill had seen before. “But, I can’t fly that far in one day,” said the butterfly. 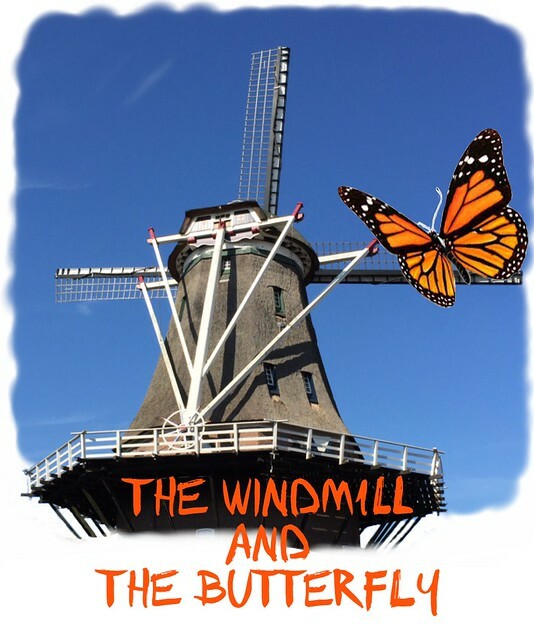 The windmill looked sadly at the butterfly. Would his dream be nothing but a dream after all? The windmill was too occupied with his grieve to notice that the wind had returned. And so it went. Every morning the little butterfly was taken by the wind to faraway places, and was brought back to the windmill when the sun went down. The windmill listened to all the stories eagerly and lived through all adventures with such intensity that it could have been his own adventures. Weeks passed and summer became autumn. “But, I’ll miss you!” said the windmill. 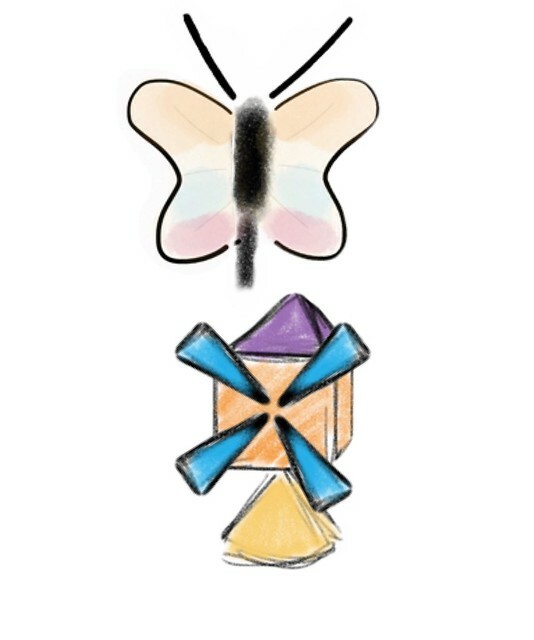 The butterfly said farewell to the windmill and the windmill waved a last goodbye with his slowly turning sails. The wind lifted the butterfly with its weary body and took it to the meadow nearby. In the green grass of the meadow stood a beautiful young woman. The young wife of the miller’s son looked up and saw the little butterfly approaching. She lifted her hand and the butterfly landed gently on her finger. The young miller’s wife put the butterfly on her bare shoulder and together they watched the sunset. The little butterfly, tired yet satisfied of everything that she had seen, closed her wings for the last time while the windmill’s sails turned to the gentle breeze of the wind. The children were all silent. The little ones had fallen asleep already, and some had tears in their eyes. “Nana tell us more …” they cried all at once. The children went home. Even little Boo went searching for his mama. All turned quiet as the night set over Bovine Texas.